Ralph Lauren’s collection had a Gatsby feel, but also included menswear-inspired fabrics and cuts, black velvet, gold, fuschia satin and deep purple velvet. 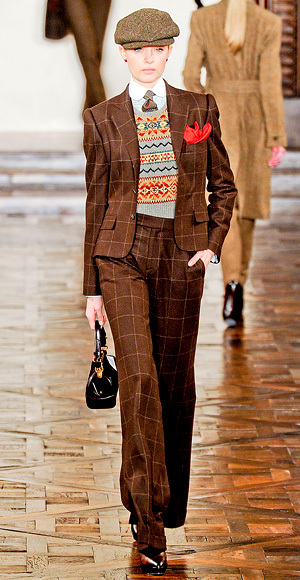 It was very rich, very fall and very chic. How apropo that Marchesa’s line included several ethereal pieces that said “Cupid” to me. I loved the soft look they had. Oooh! More plaids and unusual combinations from Michael Kors. The cut, the flare: I love it all! For fall 2012, I’ll be on the lookout for black, black leather, lace, some feathers, menswear fabrics and cigarette pants. I don’t think I’ve ever been more excited for a new season. This entry was posted in culture and tagged style. Bookmark the permalink.